Nuclear Power Corporation of India Limited (NPCIL) is responsible for site selection, design, construction, commissioning, operation, maintenance, waste management, renovation & modernization, upgrades, plant life extension and decommissioning of nuclear power plants. Its mission is to develop nuclear power technology and produce nuclear power as a safe, environmentally benign and an economically viable source of electrical energy to meet the increasing electricity needs of the country. Presently, NPCIL has 20 Nuclear Power Plants (NPPs) in operation; 18-Pressurized Heavy Water Reactors (PHWRs) and 2-Boiling Water Reactors (BWRs), with a total installed capacity of 4780 MWe contributing about 3% of the total electricity production in the country and is constructing six NPPs with a total capacity of 4800 MWe. Unit-1 of Kudankulam NPP is likely to be made critical soon. In addition, a 500 MWe Prototype Fast Breeder Reactor (PFBR) is being constructed by BHAVINI. With the completion of these projects under construction, the total nuclear power capacity in India will become more than 10,000 MWe in the next 3-4 years. As per integrated national energy policy, target of 63,000 MWe for nuclear power is set to get installed capacity by 2032 both with indigenous efforts by pursuing PHWRs and FBRs as well as by utilizing imported technologies. India is one of the few countries in the world who is harnessing nuclear power for more than 40 years and built up about 370 reactor years of valuable experience. Over the years, NPCIL has taken several steps aimed at improving the safety and reliability of the operating stations. The resulting improvement is best reflected by increase in overall plant availability factor exceeding 90% for some years in the past decade, despite initial teething problems in some of the new reactors. Many of NPCIL’s NPP units have continuously operated for more than 300 days. 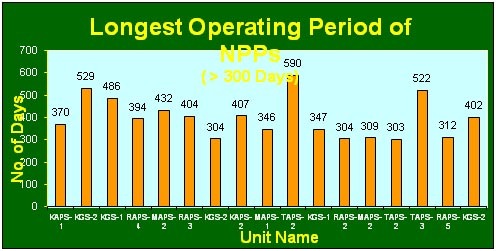 TAPS-2, TAPS-4 and KGS-2 have registered continuous operation of 590 days, 522 days and 529 days respectively, in the recent years. NPCIL has so far generated about 398 billion units of electricity. 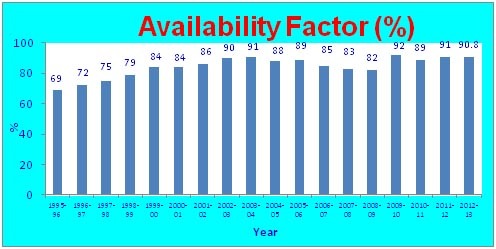 NPCIL units have also performed quite well in the areas of nuclear safety and industrial safety. Most of the NPCIL units are amongst the best in the world with respect to nuclear and industrial safety performance which is reflected by safety performance indicators and industrial safety indicator of World Association of Nuclear Operators (WANO). During about 370 reactor years of operation, none of the NPCIL unit had any accident as per International Nuclear Event Scale (INES) and actual off-site emergency requirement have never arisen. All NPCIL units are ISO 18000 certified and are complying to the environment aspects and therefore are truly a source of green energy. NPCIL has indigenously built 14 reactors of 220 MWe and 2 reactors of 540 MWe. Over the years, NPCIL has in-built strengths in almost all the areas of nuclear power generation. These include design, construction, commissioning, project execution, operation, ageing management and safety upgrades. A complement of about 12000 highly trained and experienced employees support these function. It designed PHWRs of 220 MWe and 540 MWe and later finalized the design of 700 MWe PHWR. The construction of 4 reactors of 700 MWe is in progress. Construction and commissioning of its recent plants was completed in record time, matching international standards. NPCIL has carried out some high end rehabilitation, retrofitting and safety up-gradation work, viz. En-masse coolant channel replacement in RAPS-2, MAPS-1&2, NAPS-1&2 and KAPS-1, En-masse feeder replacement work in RAPS-2, MAPS-1, NAPS-1&2 and KAPS-1, replacement of hair pin type heat exchangers of steam generators in MAPS-1&2, repair of end shield leak in RAPS-1 and KGS-3, repair of moderator inlet manifold in MAPS-1&2, Calandria vault leak in KAPS-1, etc. These important tasks were carried out with completely indigenous efforts utilising in-house capabilities for development of tools and tackles, their fabrication and deployment in field. NPCIL has also carried out several safety upgrades in older NPP units to bring them at par with current standards, viz. Retrofitting of high pressure emergency core cooling system in RAPS-2, MAPS-1&2, strengthening of emergency AC power system under SBO condition / flooding condition in RAPS-2 and MAPS-1&2, strengthening of emergency AC power system in TAPS-1&2, etc. The above actions have improved the safety and reliability of nuclear power plants. In NPCIL operating plants, upgrading safety has been a continuous process, learning from in-house, as well as international operating experiences. 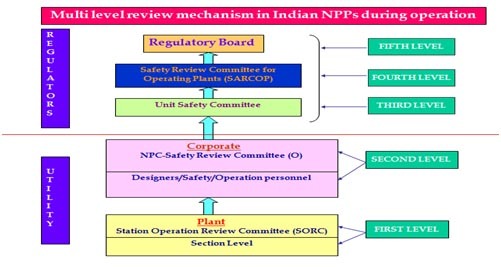 There is a multi tier review mechanism in Indian NPPs during operation for thorough review of all the aspects relating to NPP operation including events of safety significance. A robust mechanism is in place, establishing the criteria for reporting of events. The first two levels of review is carried out at utility level i.e. at stations and corporate office and the third, fourth and fifth level of review is carried out by the regulators. As far as operating stations are concerned, Safety Review Committee of Operating Station (SARCOP) is the final authority for safety reviews and approvals. The reviews involve events and significant events taking place in the plant, engineering modifications involving plant safety, procedural changes related to safety which may arise as a result of in-house, external or international operating experience, etc. In addition to the above, there have been several programmes initiated by AERB, which are continuously helping NPCIL in enhancing the operational safety of its plants. Some of these programmes include AERB guides/codes/audits/ inspections/ discussion meet on specific subjects, etc. Regulatory clearance is required every five years for continuation of plant operation. This involves limited review of plant. Station provides the relevant information, data and documents to regulators in the specified formats. <>This review is carried out by regulators every ten years. This is a comprehensive review which includes PSA studies and safety analysis as per prevailing standards. Fukushima accident in Japan due to Tsunami on 11th March, 2011 was fully analyzed. Post Fukushima accident, task forces were constituted by NPCIL for reviewing the safety of our stations under various conditions. The analysis concluded that the existing design of our plant is robust. To further enhance defense in depth, several improvements were suggested, which were related to additional provisions for core cooling / spent fuel cooling, augmentation of power sources, augmentation of on-site water inventory and the arrangement for transfer of water from nearby sources etc. The identified activities to safely handle extreme natural events are nearing completion at all NPCIL operating plants. NPCIL has systematically implemented the operating experience programme at all its stations. A Head Quarter Instruction was issued to guide the stations in uniformly implementing the programme. Several senior officers have been provided access to WANO, COG, INPO and IAEA websites. Operating Experience Review Committees at stations and HQ periodically discuss in-house and external operating experience. 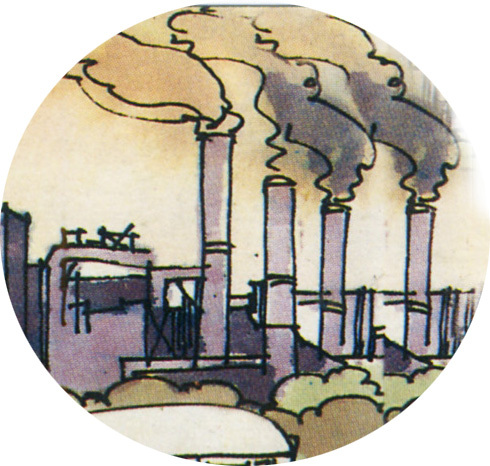 HQ issues the Flash Reports on the important events taking place in our plants for the benefit of other stations. Operating Experience Feedback Reports are issued for the events / issues having good learning points. Several Task Forces have been constituted, viz. TG Task Force, Electrical Task Force, C&I Task Force, FHS Task Force, etc. In these task forces important operating experience issues are discussed. Operation, maintenance and design engineers are the members of these task forces. 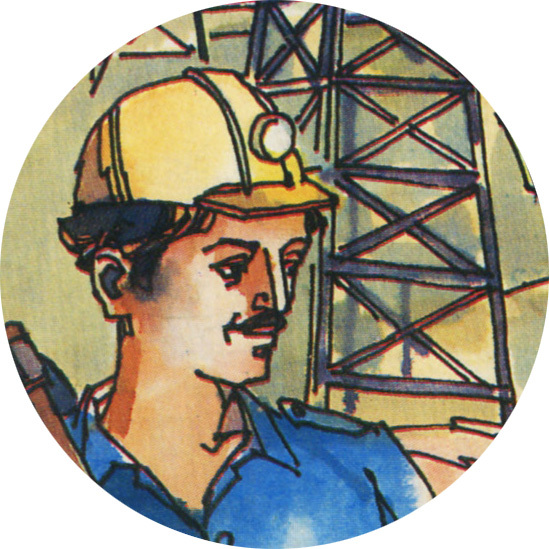 NPCIL has taken up the Corporate Social Responsibility (CSR) in a focused and structured manner. A separate directorate has been created at corporate office to take care of CSR activities. A system was developed to take up the CSR works in the villages in the vicinity of nuclear power plants. A focus has been given to the villages in the area of 5 km radius of the plant and the villages adjacent to the township for the development. List of villages in area of 5 km radius has been prepared along with details of existing schools and primary health centre. The need / requirement of villages are sought from villages head and representatives with the concurrence of state government officials. Education, health and Infrastructure like provision of drinking water facility, community hall, approach roads, etc. have been given importance. Emphasis is being given on educational support which includes construction of class rooms, school building, supply of equipments and furniture, etc. Sponsorship of students to higher studies, opening of 10+2 schools, construction of hostels are some work which are planned. NPCIL has enhanced its outreach activities by adopting a multi pronged approach using the various available tools, reaching out to larger populace across the country, the earlier normal public awareness programme based on a classical approach has been re-energized to effectively reach out to a much larger populace and address all their concerns in a credible manner. There were some existing concerns related to loss of livelihood and issue of compensation and rehabilitation on land acquisition at new sites which are being addressed in parallel. A permanent exhibition named ‘Hall of Nuclear Power’, housing the exhibits, models, mockups, and interactive modules on power and non power applications of the Atomic Energy, Safety, Radiation and other aspects including virtual tour of a reactor of nuclear technology has been developed at Nehru Science Centre (NSC), Mumbai. The Hall of Nuclear Power was developed by the collaborative efforts of NPCIL and NSC. Since its formal opening for public in August 2011, about 200,000 people including students and teachers have visited this facility. It is planned to utilize this facility to generate a correct perspective about nuclear power among children/ students by arranging the NPCIL funded/ facilitated visits of over 50,000 students of the western region in the coming month. NPCIL has given safety as the overriding priority and all its programmes are focussed on improving the safety and reliability of its plants. It has overcome several challenges in the past with relative ease. However, the new challenges have emerged in recent years. It is now focusing on addressing the new challenges and will certainly overcome them with its proactive approach and eagerness to succeed.